A Functional Details page has been prepared so as to display the functional information of individual proteins: Biological process, Cellular location, and Biochemical function, with the residue-specific information, if provided. The information comes from several databases and literature sources. The GO (GeneOntology)Consortium produces a controlled vocabulary that can be applied to all organisms. The information concerning a particular protein's Biological Process, Molecular Function, and Cellular Component is collected and described in GO ( http://geneontology.org/ontology/gene_ontology_edit.obo ). PDBMLplus at PDBj includes GO annotations for protein chains. The correspondence between PDB chains and GO IDs are extracted from the ID mapping file provided by UniProt ( ftp://ftp.uniprot.org/pub/databases/uniprot/current_release/knowledgebase/idmapping/idmapping_selected.tab.gz). The SITE information in the original PDB data is displayed with the type name "SITE". The names of chain and residue are those defined by authors, which appear in the original PDB flat files. The ligand binding site information is extracted from every PDB structure as the residues, any atoms of which are close to atoms identified as "HETATM" excluding the residue names of "HOH", "WAT", "PO4", "SO4", "MSE", "TPO", "SEP", "PTR", "HIP", "PAS", "ASQ", NA ", and "CL " less than 5.0 Angstrom. The "HETATM" residues composed of less than three atoms are also not counted. Every functional site is displayed with the type name "binding site". The chain-names and residue numbers are defined by the authors, which appear in the original PDB flat files. The amino acid residues identified as the motif sequences by PROSITE/UniProt is annotated from Scan Prosite ( http://www.expasy.org/tools/scanprosite/ ) and displayed with the type name "PROSITE". The chain-names and residue numbers are defined by the authors, which appear in the original PDB flat files, automatically regularized after sequence alignment between the sequences in SwissProt/UniProt data and PDB data. The catalytic information of enzymes is collected and distributed as CSA (Catalytic Site Atlas)database, where the catalytic sites of representative enzyme proteins are annotated by C.T.Porter, G.J.Bartlett, and J.M.Thornton (http://www.ebi.ac.uk/thornton-srv/databases/CSA/). 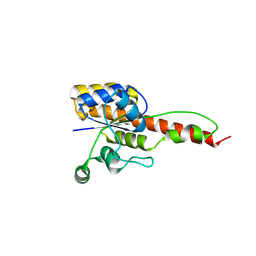 The CSA information is annotated to the individual protein with the site_id and type name as "CSA#" and "catalytic site", respectively, where # is the ID number. The chain-names and residue numbers are defined by the authors, which appear in the original PDB flat files. 2. Align the query sequence to all the PDB sequences using BLAST. 3. If all catalytic residues are contained within the BLAST alignment and all catalytic residues are conserved (100% identity), the function of the new (template) sequence is likely to be the same as that in the CATRES file. For each pair of residues (i) in the query, find the pair of atoms with the smallest distance (dq_i). Compute the same distance in the templates (dt_i). Compute rmsd as sqrt( sum_i( (dq_i-dt_i)^2 )/Npair), where Npair is the number of residue pairs. Questions and comments about the Miner should transmit mail to pdbj-master.